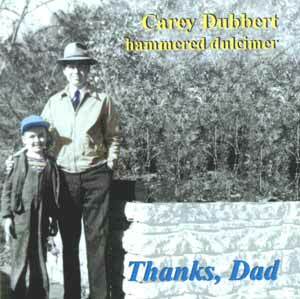 Thanks, Dad is a delightful mixture of solo hammered dulcimer and ensemble pieces. The instruments are all traditional and have been carefully recorded to retain their natural acoustic sounds. The pieces are drawn from many sources and styles, and the arrangements have slowly and naturally evolved over the years. Carey Dubbert and the other members of Malarkey hope you enjoy our music. This album was inspired by the cover picture of me and my dad on a family picnic at Whitewater State Park in Minnesota. When I found it, I was reminded of how much my passion for music comes from growing up with Dad. He listened to the Metropolitan Opera on the radio on Saturdays, Toscanini and the NBC Symphony on Sundays, and other classical music wherever it showed up. He had played marimba for silent movies and Chautauqua. We had a marimba in the dining room and a piano in the front room. 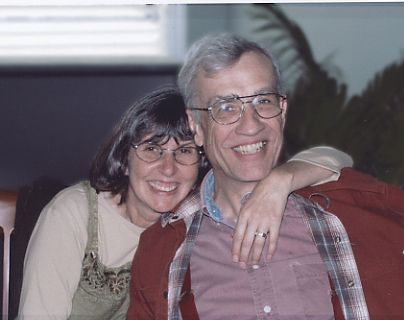 In winter he played percussion for the Rochester symphony and in summer for the park band. His fingers were always tapping out a tune; music was his joy and passion. I am blessed to have had him for my dad. Thanks, Dad. Arrangement by Liz Browder. Dulcimer. Maurice Hallison of Madagascar wrote this haunting song which I first heard on a Trapezoid album performed by Freyda Epstein. Dulcimer. J.A. Butterfield. A lovely air written in America in the 1800's. Amazing vocals, guitar, and dulcimer. Suo Gan is a beautiful Welsh folk song which Jim first played for me. It was used in the movie Empire Of The Sun. Guitar and dulcimer/flute and dulcimer. I first heard this played by Bryan Bowers on the autoharp. Dulcimer. The Twisting of the Rope An Irish-Gaelic song of thwarted love. Dulcimer, guitar, vocals, and whistle. J.S. Bach chorale #367, one of Dad's favorites. Dulcimer. unknown / O'Carolan. I first heard Malcolm Dalglish play the hymn, and this arrangement of George Brabazon is from Kim Robertson. Dulcimer. Written in 1913 by Reverend George Bennard. Dulcimer. Bach-Gounod / O'Carolan. Denis O'Conor was written for O'Carolan's friend, the last great Irish king. Dulcimer and more amazing vocals/dulcimer and mandocello. The Xmas Song was written by Dad as part of a college music class about 1930; he sent hand written copies to family members for Christmas. Dulcimer. O'Carolan (dulcimer arr. by Claire Leverant)/unknown. Chief O'Neill was a fire chief in Chicago around 1900. He is responsible for publishing around 2,000 traditional tunes. Penny whistle, mandolin, dulcimer, guitar, and bodhrán. Vangelis I originally learned this lovely piece as a gift for my wife and it quickly became one of my favorites. Dulcimer. An old Sicilian folk song which is often heard at Christmas. Vocals and dulcimer. "Hymne" is © 1979 (Vangelis/Polydor,S.A./Harry Fox Agency). All other titles are Public Domain.